There have been numerous attacks on bikers along the Midtown Greenway in November and December, as detailed in the The Bridge, Star Tribune and the Midtown Greenway Coalition. On Dec. 13, a group of cyclists decided to ride down the greenway after dark to raise awareness about the attacks and promote continued use of the greenway. The UpTake's "Gook" video has garnered a lot of good response. Thanks to everyone who has emailed, commented, and Twittered. There's a ton of (often crazy) near-conversation on the Veracifier version, and it's been posted on AlterNet, Huffington Post, Brave New Films, and several other blogs, including most prominently Minnesota Public Radio's NewsCut with Bob Collins. Bob started out talking about the thorny issue of racism, especially accusations of racism in an election year, which I agree merits healthy skepticism. But then he set his sights on the way I covered the story. We've gone round and round, and near as I can tell, Bob is unhappy with a video only about Irwin Tang's book, though the basic facts of the story are sourced. For example, in the video Tang talked about McCain wanting to kill the Iranians with cigarettes, and sang "Bomb bomb Iran" in response to a question about Iran. Tang argues that this sort of dehumanizing is a preparation for war upon those people. Considering McCain has warned of Iran 'Armageddon', and promised "I'm sorry to tell you, there's going to be other wars. We will never surrender but there will be other wars," I don't think that assertion it unreasonable. Perhaps more links or quotes by McCain in the video would have underscored the validity of Tang's assertion. More information, more research, and a deeper story are certainly there for the making. I don't claim this video is the be-all end-all, or the most comprehensive video on the subject of McCain's alleged racism. But it is a story, and a good one I think, presenting Tang's case, a history of the word "gook" and it's connection to U.S. wars and invasions, and Tang's own experience with the word "gook" as a Chinese-American. Bob Collins seems to want me to go find someone trying to prove John McCain is not a racist, or wants a documented conversation between Tang and McCain. This is not that story. That story would be good, too - not better, necessarily, but different and informative. I welcome Bob Collins, or anyone else, to make that story. The more the merrier. I stand by my work, and I'm damn proud of it. Collins says he likes non-political stories about people. I like making stories about people, too – in fact that's what I love, and why I'm a documentarian. But, I will not shy away from people with controversial stories. 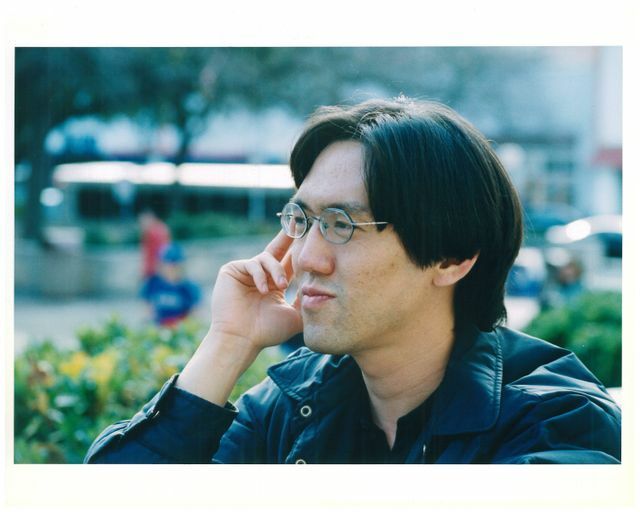 I find Irwin Tang's story, and the case he makes, compelling. I hope people know more about the term "gook" and John McCain's use of that word after watching it – I sure do. Little known to the general public, in order to keep our "mainstream press license", The UpTake needs to release a video of something exploding at least once per year. Here is our entry from St. Paul, MN. Embedded using this fine Embed Code Generator for High Quality YouTube Videos. 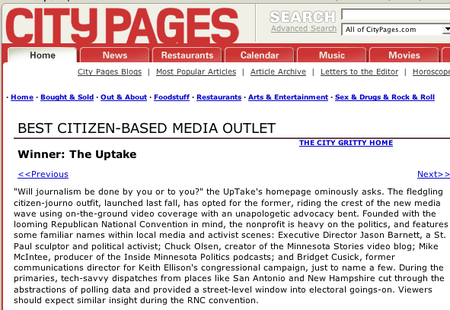 FOX 9 News interviewed me about The UpTake's involvement in "I Approve This Message." What a fookin' Dork. Video people - that's all of you - help out this project by making a short video of what you'd want to ask the RNC or DNC. End it with, "I Approve This Message." C'mon it's fun! South Minneapolis will be proud: Atmosphere performs "You" on the Late Show. Killer. UPDATE: I Just realized who that woman is singing on this awesome tune, and the last few Atmosphere albums: My old friend from Twin Cities Public Television, Mankwe Ndosi. Sweet! We used to work on a project called Learning Park and we on the teevee together once. She's an amazing improvisational vocalist and all-around love energy kind of person. Max Sparber, raconteur, editor of MNspeak. Eda Cherry has the evidence. 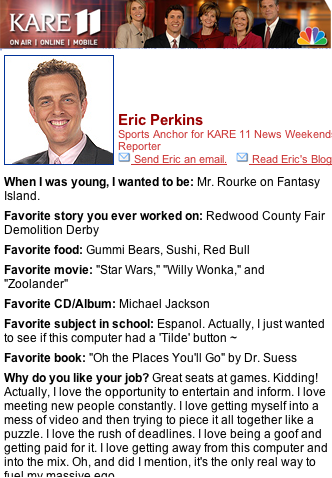 OMG i want to hang with Eric Perkins! Seriously, this is a dream come true. I've always loved the City Pages Artists of the Year and Best of the Twin Cities issues. A few years back I got to writeup my Artist of the Year (Jehane Noujaim). And now, The UpTake is named Best Citizen-based Media Outlet. I know we didn't exactly face much stiff competition (or any?) but it's cool they came up for a way to include us. And it really, truly is an "us" thing, as Mike McIntee said in the UpTake email: "Everyone who has contributed video, text, time, comments or just moral support helped us win this. So this is an award, not for an organization as much as it is for a community and a movement." Mad, Angry Props to my favorite local blog (heck, one of my favorite blogs period), Mediation. Mostly unrelated: Minnesota Stories, which tragically never earned a Best of TC mention, is now back online. Thanks to everyone who let me know. I guess MNspeak isn't the only site that doesn't pay it's hosting on time.